Hello everyone! 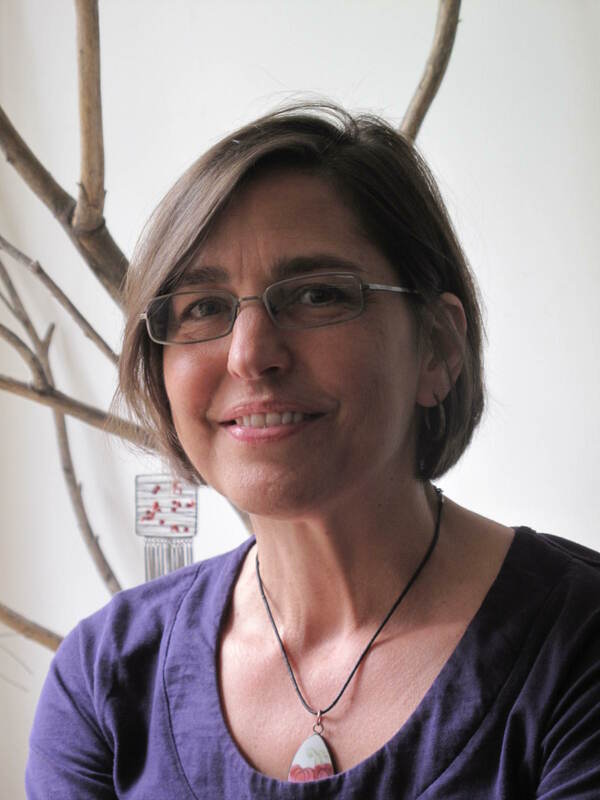 Today I am pleased to interview Adele Caemmerer, an artist and teacher who lives in India. Carrie: Where are you from? Where are you now and what are you doing there? Adele: I grew up in Arkansas, in the southern part of the United States. However, I have spent most of my adult life overseas. I started out in Taiwan, teaching art in an international school, took a break for a few years back in the United States where I did a combination of teaching and retreat work, and have spent the last 15 years living and working as an art teacher in an international school in New Delhi India. Carrie: What is the main concept behind your most recent artwork? Adele: A few key questions have been guiding my recent work: How can our daily experiences and life patterns be translated into visual form? What can a set of lines convey about a moment, a place, and the passage of time? How can the movement and patterns of everyday life serve as “ random generators” of visual material? In the fall of 2010 I began to document my daily commute through motion-generated drawings on a tablet pc. It started as a fluke. I was given a tablet pc to see if this would work well with students. On the way home from work, I was testing out the stylus using a simple drawing program. I was making lines and the movement of the car was “interfering”. Then I thought, “why not go with this. Map your ride”. So what started as a moment of playful exploration with new technology has developed into a regular practice of notation that I call “traffic patterns”. I sit in my car and make repeating lines, while potholes and pavement, stops and starts, suspension and speed, all have their influence, their visual “say”. In addition to car rides, I have documented train, bus, plane, metro, and boat rides, even a safari. My rule about these drawings is that I work in the moment of journey, no editing. Though the bulk of these drawings are digital, I have also generated drawings in other media such as pencil, pen, and marker. Like an EKG tracks heart rhythms, these drawings track the rhythms of the road as well as of life. Patterns of everyday life serve as “random generators” of visual material. Carrie: How do you come up with ideas for your work? Adele: Observation and curiosity are my portals. Some visual or conceptual phenomenon captures my attention enough to spark a question and then an investigation. In this current series, “observation” has taken the form of attention to the moment and capturing both the uniqueness of the moment as well as the patterns that emerge over time. I see myself as a data gatherer, surfing daily life for details and patterns that could tell a story. It becomes a lens for looking at life. I am interested in how what seems to be impersonal material can tell a very specific story. Carrie: Do you have a favorite medium? What is it and why? Adele: While I have worked with painting and printmaking, my affection is clearly rooted in the process of drawing. I love the graphic quality of drawing and the power of line and value to define shape, motion, space, and time. At the moment, I am drawing on digital devices, as well as with pencil, pen, and watercolor. Carrie: Describe your creative process. For example, do you value routine or time more for creating your art? Adele: My current work depends on routine. The routine of observing and documenting anchors me, enabling me to track the dynamic of the moment, to see patterns, and investigate ways to bring these patterns into visual form. I like to work in series. I like the momentum. There is a balance of continuity and freshness. One thing leads to another and the work develops organically. Ideas are refined, shifts in the routine or materials open new avenues for investigation. There is also a practical element. As a full time art teacher & mother, routine keeps me regularly touching into my creative work despite a fairly demanding schedule. Another key aspect to my recent work is that of chance. By incorporating a random generator as part of my process, I am curious to see what the experience yields. I like the surprise of this as well as the sense of being in some sort of dialogue with an experience. Carrie: What has been your greatest challenge as an artist? Adele: My greatest challenge has been balancing demands of my commitments to work, family, and community with my needs as an artist for time, space, and a reserve of energy. For many years I have longed to be more engaged with my creative process but have not been clear the direction to take it. Carrie: What do you wish you knew when you started making art that you know now? Adele: I wish I knew to trust the raw curiosity that comes from attention. The seed of this, no matter how small, is precious, and with tending, can grow into something artful. I am grateful to be more comfortable with the imperfect, unfolding-as-you-go nature of creative work. Carrie: You have a recent gallery opening at the Drawing Room in New Delhi, India. How long is it running and where is it located? Adele: The show went up on October 20 and will run into the new year. It is located in a boutique clothing shop and café featuring the fashion designs of Alecca Carrano. The shop is part of a newly emerging, informal collective of designers and entrepreneurs in a neighborhood called Shapur Jat. Carrie: How did the show come together? Adele: I met Alecca and was curious if she knew of a good screen printer. She did. This led us into conversation about the “traffic patterns” project. Alecca invited me to collaborate with her in the design of clothing using fabric imprinted with a “traffic” story. Alecca incorporated this fabric into her clothing designs for fall. We held an opening that featured her clothes and my framed “traffic pattern” prints. Carrie: What advice would you share with others who are interested in exhibiting their work? Adele: Keep with your work, try out your ideas however small they might seem, share your ideas liberally, find others who are putting themselves out there, join them. For me the collaboration aspect is key. It is all about broadening the conversation beyond oneself. Adele: Creativity is the process of tapping one’s pulse, questioning, investigation, making connections, synthesizing and then translating one’s discoveries into some form of exchange. I believe it is a human right and innate human response to life- not at all limited to artists. Artists however have a role in living out the path and process on behalf of their communities – to be a pilgrim in this territory and voice for this aspect of life. A special thank you to Adele for her time with Artist Strong. Below is her artist statement for her current exhibit. My recent work has been an investigation of the translation of daily experience into visual form. In the fall of 2010 I began to document my daily commute through motion-generated drawings. What started as a moment of playful exploration with new technology has developed into a regular practice of notation in a variety of media that I call “traffic patterns”. In the drawings produced while riding in vehicles, potholes and pavement, stops and starts, suspension and speed, all have their influence, their visual “say”. In the drawings made by observing and documenting the human, animal, and vehicular traffic patterns of the morning in my neighborhood, time of day and order of appearance set the tone. Like an EKG tracks heart rhythms, these drawings track the rhythms of the road as well as of life. Patterns of everyday life serve as “ random generators” of visual material. BE COURAGEOUSLY CREATIVE: Can you be “grateful to be more comfortable with the imperfect, unfolding-as-you-go nature of creative work?” How can you bring yourself closer to this acceptance of the creative process? I am from India. Your paintings on the traffic patterns in India are interesting!! Hi Sudha, I made sure to share your thoughts with Adele so she knows that you enjoy her work. Best wishes!